Anita Sintes' K-2 classroom is full of the life and vitality one would expect from a room filled with kindergarten students. A veteran of the Boston Public Schools, Anita's work at the Hernandez Elementary School is an enduring testament of her love for learning and her commitment to the children of Boston. As a latina educator (Anita's family immigrated from El Salvador) Anita reflects the ethnic diversity found in her young students and the more than 40,000 students of color across the Boston Public Schools. As Boston's demographics continue to shift, the Boston Public Schools is committed to employing a workforce that is reflective of our city's children. Best thing about Boston teachers: The social and intellectual capital they bring to their work. How to unwind: A burger and a milk shake sounds like a perfect way to unwind. Tasty Burger or Shake Shack...I can’t choose one! 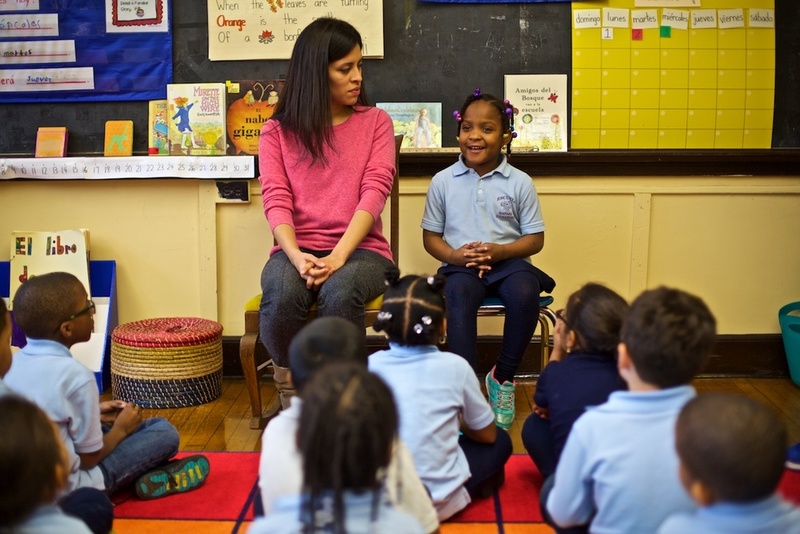 The Boston Public Schools Office of Human Capital sat down with Anita Sintes in fall 2014 to learn more about her experiences in the Boston Public Schools as a community member, teacher, and educator of color. Here's what we learned during our time with Anita. Why do you teach in Boston? I believe in the power of education and therefore the role of teachers and students in contributing to social, economic and political change. I live and work in Boston. As a member of the community, I am committed to teaching in Boston. As an early childhood teacher, I am committed to fostering a love of learning through authentic experiences for my students. Why do you believe education is important? All children deserve a quality education. My mother believed in the power of education, she believed it was the catalyst for change in our lives. I grew up in an urban setting and I attended public and private schools. I had great teachers in both settings, however, the cultures were different. In private school, the expectation was the same as my mother's: a college degree. In public school, expectations were blurred; college for some, vocational school for others and even dropping out became an option. As a teacher of young children, I want my students to know that I have high expectations or all of them. I see myself in the students I teach, and I believe in their potential. What is the "coolest" thing about your school? The Rafael Hernandez is a bilingual school that has a strong focus on expeditionary learning. In Kindergarten, students engage in yearlong studies of birds, recycling and planting. Our students explore and care for our community garden, enabling them to learn through meaningful, hands-on activities. Children plant and harvest vegetables and make soup out of the vegetables they have grown themselves. These authentic experiences enhance language learning and encourage students to express themselves in two languages! What was your best moment as a teacher? One of my former students, now in second grade, was asked where she learned the reading strategy “Tryin' Lion.” The girl told her excitedly, “Señorita Anita’s class!” It made my day! What makes you come to school each morning? The warm smiles and the genuine excitement of my kindergarteners who greet me each morning. Their love for learning is inspirational.